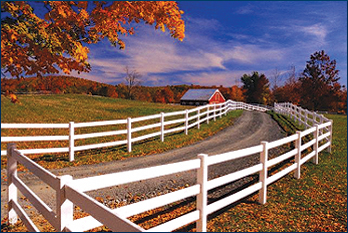 Vermont Horse Farms and Horse Properties For Sale. To see Vermont or New Hampshire horse farms and properties for sale, place your mouse over the county of your choice on the map and click it. Vermont has a large equestrian community with many events to participate in. The Green Mountain Horse Association offers events in central Vermont, the Vermont Morgan Horse Association celebrates the morgan horse, and offers events statewide. The Vermont Quarter Horse Association offer competitions and shows in , dressage, barrel racing, and trail riding and team penning one of the fastest growing equine sports in America. Another popular sport in Vermont is Polo, with events held throughout the state. Since 1931 Vermont Hose Shows Association offer 170 championship competitions in 24 divisions for all ages and skill levels. The Vermont Sumner Festival Horse Shows holds events from July till August paying out tens of thousands of dollars and drawing competitors from around New England and Canada. The Vermont Horse Council has information on the Vermont horse industry, laws, and regulations. Visit our Vermont Horse Owners resources page for a comprehensive list of organizations, and service providers. Just minutes from downtown Woodstock, 53 acres of beautiful land, 13 acres of mown fields and 40 acres of managed woodland laced with 2.5 miles of manicured trails, and a pond. 3 bedroom 3 bath Cape with Ell plus a 1 bedroom / 1 bath attached guest suite with kitchenette and separate entrance. 4200 sq ft in total. Maple floors, updated kitchen with 48� Wolf range, 9� ceilings, spacious living room with fireplace. Full basement and attached 2 car garage. Superb private setting off a dead end dirt road in a neighborhood comprised of some of the Woodstock area�s most valuable estates, with direct access to GMHA�s renowned horse trail network. Fiber optic internet through EC Fiber. Owner is a VT real estate broker. Click Here for additional info. Approx 2 mi from Exit 8, I-91, less than 2 hrs from Hartford CT and 2.5 hrs from Boston, and only 30 mins from Dartmouth College or the lovely village of Woodstock VT, this historic farm on Goulden Ridge offers 228 acres, a thoughtfully renovated 4 bedroom 3 bath C.1800 colonial farm house, large barn which includes 6 stalls, and a fully equipped sugar house. The home is surrounded by mature landscaping, fruit trees, gardens, a swimming pond, and an in-ground pool. Of the 220 acres, 50ac are a 1/2 mi long flat hay field. Over 5 miles of trails wind through the acreage. The property enjoys views to Mts Ascutney, Sunapee, Monadnock, Moosilauke, and Washington, with sweeping views over the CT River valley. Click Here for additional info. Just minutes from downtown Woodstock, 33 acres of beautiful land, 10 acres of mown fields and 23 acres of managed woodland laced with 1.5 miles of manicured trails, and a pond. 3 bedroom 3 bath Cape with Ell plus a 1 bedroom / 1 bath attached guest suite with kitchenette and separate entrance. 4200 sq ft in total. Maple floors, updated kitchen with 48� Wolf range, 9� ceilings, spacious living room with fireplace. Full basement and attached 2 car garage. Superb private setting off a dead end dirt road in a neighborhood comprised of some of the Woodstock area�s most valuable estates, with direct access to GMHA�s renowned horse trail network. Fiber optic internet through EC Fiber. 20 additional acres available. Owner is a VT real estate broker. Click Here for additional info. Approx 2 mi from Exit 8, I-91, less than 2 hrs from Hartford CT and 2.5 hrs from Boston, and only 30 mins from Dartmouth College or the lovely village of Woodstock VT, this historic farm on Goulden Ridge offers 228 acres, a thoughtfully renovated 4 bedroom 3 bath C.1800 colonial farm house, large barn which includes 6 stalls, and a fully equipped sugar house. The home is surrounded by mature landscaping, fruit trees, gardens, a swimming pond, and an in-ground pool. Of the 185 acres, 50ac are a 1/2 mi long flat hay field. Over 5 miles of trails wind through the acreage. The property enjoys views to Mts Ascutney, Sunapee, Monadnock, Moosilauke, and Washington, with sweeping views over the CT River valley. Abutting 35 ac parcel available separately for $125K. Click Here for additional info. 3 bedroom 2 bath 2400 sq ft Colonial on 6.6 acres of open land with a 3 stall barn. Hardwood floors, fireplaces in the spacious living room and master bedroom, bright sunny rooms, full basement, attached 2 car garage. Directly connected to W. Windsor�s recreational trail network. Privately sited with southern exposure and westerly views. The open land, barn, some existing fencing, and riding ring make the property well suited for animals. Click Here for additional info. Desirable location on Rush Meadow Rd. Charming 2 bd 2 ba log cabin on 10 acres with approx 2.5 acres of open pasture. 3 stall horse barn with hay storage above. Cabin has cathedral ceiling living room with fireplace, large porch and deck overlooking the pond. Excellent trail access, surrounded by equestrian properties. Click Here for additional info. Long range views, southern exposure, superb neighborhood. 4 acres of open pasture, private home site, managed hardwood and pine forest laced with manicured trails. Extensive road frontage. Minutes from Woodstock, directly connected to the GMHA horse trail network. Super high speed internet available from EC Fiber. Click Here for additional info. and Vermont Horse Assoc. |VHA| events and are in Windsor County. A range of recreational options surround this lovely, secluded homestead just two miles south of historic Woodstock Village. A classic country home elegantly updated with custom cherry cabinets & Viking, Sub Z equipped kitchen. The rooms are of generous proportion and filled with natural light. There are two wood burning fireplaces (one with a brand new high efficiency insert) and a new propane stove in the Living Room. Top quality mechanical systems including Buderes boiler, automatic generator and newer thermal windows.The house overlooks a rolling green lawn to a spectacular spring-fed swimming pond complete with a dock and raft. Relax on the deck by the in-ground, heated pool. The recently restored barn/ studio/guest house is well appointed to suit your needs or generate a handsome income flow as a rental unit. Plenty of room on the walkout lower level for additional accommodation or direct entry home occupation. Direct access to a woodland trail network. Equine potential just steps from a magnificent trail system. Lovely, established perennial gardens, blueberries, and fruit trees Within minutes to Hanover, NH, DHMC, GMHA, I-91, Skiing and Recreation. Additional 9+acre buildable parcel with solar array available. Click Here for additional info. MOTIVATED SELLER! This stunning custom country home was designed to integrate indoor and outdoor living spaces with over-sized windows to invite nature in. French doors open to beautiful stone terraces & footpaths flowing through spectacular established ornamental gardens with sweeping long range views. The spacious multi-level design of the home features wide open spaces for large gatherings & intimate lofts and coves for down time. The well appointed open concept chef's kitchen features custom cherry cabinetry, soapstone counters, quality stainless steel appliances & beautiful VT slate tile floors. Superior fit & finish using the finest materials and craftsmanship throughout. Hubbardton Forge fixtures, 3 Jotul stoves, new Pella windows, Full house auto generator, gorgeous Master suite w/AC. Equine potential with close proximity to GMHA trail system. Priced $1.2 million below Seller's investment. Just 15 min to Woodstock Village, I 91, Skiing, Hiking, and Recreation. See the attached 360' video! Original home was constructed in 1987 with a total overhaul renovation by Les Berge Construction between 2005-2007. Click Here for additional info. Magnificent private horse farm sits on 20+ acres on the side of Mnt. Ascutney at the top of a dead-end road abutting the town forest. Classic style cape has a covered porch, decks, garage, outbuildings, two barns (13 stalls), and a run-in shed. Let�s not forget the private in-ground pool facing directly up the mountainside! This farm is on the Mt Ascutney Trail system. Ride directly from the farm, on your horse, or mountain bike, or hike on miles of amazing trails right to the top of the mountain. The spacious country kitchen has plenty of cabinets and a top of the line Hearthstone woodstove. There is a large wide pine floored living room w/cathedral ceiling and a gracious fireplace. The master bedroom has stunning views of the mountain with a private en-suite bathroom. Two other bedrooms are just off a cozy den with a Vermont Castings gas stove. The basement offers a large fitness/family room, and a spacious laundry room. The home is surrounded by cottage gardens, perennial beds, and hundreds of sunflowers which create a perfect mountain garden landscape. The horse barn is beautiful with a heated tack room, wash stall, six spacious matted stalls, 200amp power, & storage for 1,000+ bales of hay. The meadow has extensive split rail fencing, a huge run-in stall, and the additional equipment barn has 7 matted stalls w/power & water. Hop right on the VAST snowmobile trail system at the end of the driveway! 10 miles on the trails to GMHA, 20 miles to Okemo, 28 miles to Killington. Click Here for additional info. Private, nicely sited 9.79 acre building lot with south and westerly exposure. Fabulous old stone walls and substantial stone foundation give this property a unique tie to its history. Gently sloping with flat building lot near pinnacle. With some clearing up high, gorgeous views of Mount Ascutney can be obtained. Down low the views already exist. Clear the young growth to create pastures for animals and leave the mature maples for great character. An ideal location for horses since you would be right on the GMHA horse trails. Be in the heart of horse country with Running Brook Farm Carriage Barn across the road and Silver Hill Farm just around the corner. A great opportunity to build your dream home whether it is a gentleman farm, primary residence, or vacation retreat. Near snowmobiling, skiing, GHMA, and all the various outdoor experiences Vermont has to offer. 15 minutes to downtown Woodstock or I-91 giving you easy access to the shopping and the Upper Valley. Come see what potential this beautiful piece of Vermont has to offer! Click Here for additional info. 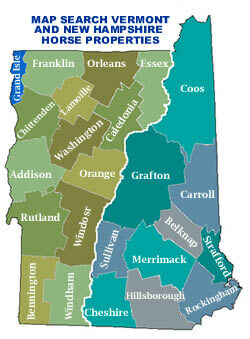 All Horse Properties in Bennington Vermont County (10) or see Homes and farms in these towns.